Resolving Conflict and Family Meetings. Family meetings provide us with the opportunity to express our feelings and opinions, regarding personal and family matters. It also teaches children to voice and deal with theirs in a practical way. Family meetings also allow for the development of communication skills and through that the improvement of self-esteem, as well as allowing themselves to believe in and rely on an emotional support system. Oh, no doubt, we are going to come across a bit of mockery and jesting when we call our first family meetings, but don’t let that put us off. We are the parents and as co-moderators we can summon everyone to sit around the dining room table to discuss family matters and come to unanimous decisions. Children can also be given moderating duties. This exercise will be extremely beneficial for them in the long run. Every member of the family must be encouraged to contribute. Nothing is too bad, or too trivial to be discussed. All the family members must be well-behaved and supportive of the “speaker” and whatever it is that presses him. Everyone must get a turn to voice his opinion, make his suggestions, or air his discontent. Delegation of family responsibilities and duties must also take place during these meetings. Praise and encouragement must be integral parts of these family discussion sessions. Planning of the week ahead (e.g. study routines for the examination period and considerate behaviour from all present) can also be addressed. The inclusion of planning for the week ahead and the time management skills which the children are exposed to at these meetings will come in good stead later on in their life. Consideration and respect are vital parts of these meetings. Interruptions must not be allowed. The speaker must be protected at all costs. We must teach our children decision-making and problem-solving skills. They must be taught to prioritize as well as to make decisions on matters that involve them. In case of conflict, the meetings must be utilized to clear the air and, after some brainstorming, to reach a unanimous and fair decision. Meetings should be held on weekly or fortnightly basis at least. The family must always be in touch and we as parents must always have our fingers on the pulse. We must make sure the meetings are fun and do not last too long. Prizes and special mentions which are attached to rewards must be part of this system of remaining in touch with our loved ones. The meetings must result in a sort of “win-win” situation for all. Parents must follow up on decisions made and the implementation of the solutions and report any feedback to the family at the next meeting. We must teach our children conventional, social and conversational etiquette. Honing these skills through practice and example will empower our children with the ability to engage in positive interaction with others. They should be taught right from wrong and share with him your experiences and how to deal with them, in order that they may also apply Pagan values and ethics to their personal decision making. It is our duty to tell our children about our family traditions, our ways and rituals, our ancestors, and to instil positivity and pride for their Pagan heritage in their hearts. By doing this we will edify our children’s sense of uniqueness, reinforce their belief in their talents and character traits, and encourage them to develop a positive self-image and compassion towards others. We should expose our children to a different things and experiences and thereby assist them in developing adaptability and the ability to overcome the fear of change, failure and the angst of tackling obstacles. Children should be taught to earn their money or how to pay back for something they have broken or lost. They should understand the law of restitution and retribution through the examples that we as parents set. We must take care that this is not being harsh, but the way things work in the grown-up world. Confessing, or owning up to our mistakes and making amends for it as well as apologizing, are also two valuable lessons that we as parents must ensure to impart to our children. We must learn to say “I am sorry!” when we are wrong. Children do what children see. Pagans are not a “People of the Book”. So how do we figure out what is ethical and moral? The following is an example how the Pagan Community view and apply social, spiritual and moral principles. How do we deal with difficult children who throw tantrums and have such strong wills they want to have their way in every single situation? As parents we never know when the dam wall is going to burst again. And worst of all we don’t know how we will deal with the child’s inappropriate wrathful behaviour which often time causes embarrassment all round. Such angry behaviour in children stems from physical or emotional pain, stress, frustration and a sensation of powerlessness. It can also be symptom of a more serious nervous disorder (ADHD, depression or bi-polar disorder). As parents we are not equipped with diagnostic tools and must resort to those in the medical profession to deal with the abovementioned disorders. All we can do is get to know our children well and know what it is that is bothering them. Is it school? Peer pressure, is he being bullied, is it insecurity caused by a turbulent family environment? What are his grades like? All we can do is wait for the aftermath of the outburst and then attempt to discuss or resolve the situation. Keeping a peaceful and calm atmosphere around the house will assist difficult children to cope with daily stresses. We must spend one-on-one quality time with our children. When we spend time with our children, let us be focused on them and them alone. This will allow them to feel they are special and that you enjoy their company when they are behaving well. Angry children need our support. They need to be shown that they are loved unconditionally, and that they can be taught how to appropriately deal with anger. Tackle the situation immediately. The situation does not get better with time; it only gets worse. Do not tolerate rebellious and disrespectful behaviour. Set down the rules. You are the parent! Repetitive cases of disobedience can really frustrate a parent. A useful tip is to be kind but firm. Get down to your child’s level, square him in the eyes, place your hand gently on his shoulder and tell him what you would like him to do. “I want you to leave the cat alone!” or “I want you to put the matches where they belong!” Most of all, an angry child needs his parents' support. He needs to be shown confidence, that he is loved unconditionally and then shown how to appropriately deal with his anger. As Pagans and parents we should beware of the mixed messages we give our children when we ask them to keep our rituals and religious activities a secret. The logical question that springs to our children’s minds is “If it is ok, why do we have to keep it a secret?” They wonder why they cannot speak about the God and the Goddess in front of family, friends and acquaintances. Why others say nasty things about our Spiritual Path if it is not true? Why they react so vehemently and accuse us falsely when confronted with our spiritual reality? It is our job to explain to our children that their vehemence is provoked by ignorance and fanaticism. Children might not have the maturity to fully understand the consequences of religious intolerance, but they sure feel these on their own skin. Parents suddenly decide that little Johnny cannot play with little Jimmy, because little Jimmy’s parents are bad people. Pagan children suddenly develop what many have termed “toxic guilt” and commence resenting their parents for it. How do we, as Pagan parents, explain to our children that it is not ok to publicly speak about our rites and rituals, our altars and magickal tools? Not unless it is someone who is sympathetic towards our religious practices. Which brings us to the next problem: do we raise our children in the Craft? Or do we keep them in the dark and ourselves in the broom closet? Is it fair to ram our spiritual choices down our children’s throats? Do we send our children to private or public schools? Or do we opt for home-schooling? Well, I believe that even when our children are not ready to understand certain complexities in life, that they can understand the great privilege of freedom, of total open communication and a spirit of sharing that reigns in a Pagan household. Our son was raised in the Craft and was taught that our rites are sacred and secret. He frequents a government school and has never discussed our spirituality at school or with his friends. However, when friends started coming over to our house for band practise, they started noticing the difference between our home and theirs. Questions followed and these were followed by concerned parents (who then kept their children away from ours). On the other hand it also lead us to finding of other esoterically minded parents in the area. Like drew like. Our son never made us feel guilty for the accusations and injustices he had to put up with in primary school; on the contrary he reassured us that all was fine and that these children and their parents were narrow minded and could not accept that people have different ways to approach the Gods/God. His character, his sunny nature helped him overcome this social hurdle, and before long, the “good Christian children” were back at our house, which has become their favourite hang out. Their parents still look at us down the length of their noses, but at least our boy’s life is no longer negatively affected. They don’t accept our differences, but they put up with them and reserve their judgment of us and magnanimously do not include our child in it. On the school register we are Pagans. Full stop! The teachers and head master know it and know well not to use the writing of Bible verses as punishment for our son, for as Dad says, one should not use religion to punish a child. We give our son the freedom to attend a Christian Youth Entertainment Centre every Friday night. He is well loved and very popular at the Centre, even though they know that he comes from a Pagan home and that he is there solely to enjoy the company of his peers, the live band, the skating, the pool tables, and of course the girls. Once he expressed the desire to attend Mass; we allowed him to go with friends, but that soon wore off, as Sol enjoys lying in late. “Churchgoers rise too early!” he says in his totally un-Apollonian reasoning. Not so long ago our son announced that he was an Atheist. He does not believe in God. I let him read the Code of Principles of the SAPC and half an hour later he had refound his Pagan self. No amount of atheistic metal music and socio-political hype can take away the sound Pagan foundations and his love for the Lord and Lady. Through the work and dedication of our Pagan leaders, the time has come in our country for us to stand up and testify to our Paganism. People who know us and know what we stand for will put two and two together and come up with the undeniable answer of 4. 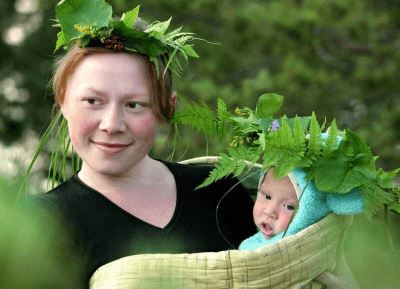 It is time to show that Pagans are reliable and responsible professionals, family people and upright citizens who pay their taxes, mow their lawns on the weekend and who occasionally hold festivals out in their gardens or in Mother Nature.